Partridge berry, Mitchella repens, an edible berry in North Georgia. Just beyond the city sidewalks and landscaped developments, where the soil is relatively undisturbed, one can discover plants which contain stories of cultural interaction for the sake of healing. Partridge berry (Mitchella repens), a charming groundcover native to eastern North America holds within its evergreen leaves and scarlet berries nature’s best-kept secret for women’s health. Partridge berry trails along the forest ground with attractive opposite, dark-green, oval leaves, with a thin white vein. Delicate pinkish-white, furry flowers bloom in pairs from spring through mid-summer, later forming edible, red berries, noticeable into the winter months. The berries are often the distinguishing, identifiable feature hikers notice in the woods. As a food, the edible berries, though bland, can be prepared in cakes, beverages, or dried for storage. The scarlet-red color indicates the presence of antioxidant polyphenols. The berries may not be super tasty, but they do offer some wild-plant nutrition. 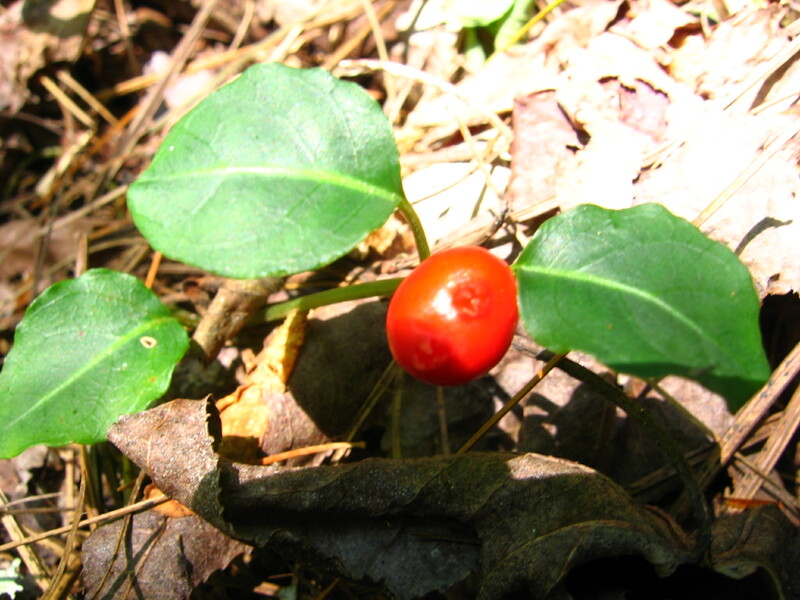 Although a valuable plant among American Indian women of several nations whose knowledge was shared with generations of American women from other cultures, partridge berry has been neglected by the biomedical community for the last eighty years, and remains in the category of domestic medicine, a term for medicine practiced within the home. Through the late 1800s and early 1900s, pharmaceutical companies offered Extract of Mitchella, or partridgeberry, for women’s health. Early medical doctors and pharmaceutical companies based their knowledge of partridge berry on its reputation as a long-standing traditional remedy among American Indian women for regulating menstrual cycles, easing pain, and preparing a pregnant woman for labor. Ethnobotanical accounts of American Indian use of partridge berry state the whole plant was also used as an antirheumatic remedy for stiff joints and muscular pain, as a sedative for insomnia, and as a gastrointestinal aid for stomachaches. After a superlative reputation stemming from centuries of medicinal use for common complaints among women, partridge berry’s curious omission from medical research leads one to question. In 1916 and 1918, researchers Picher and Mauer performed experiments using partridge berry extract on isolated uterine muscle, finding no effect, according to John Crellin and Jane Philpott’s text, A Reference Guide to Medicinal Plants (1990). Did one or two experiments performed almost a century ago on a tissue sample negate the wealth of traditional use in live women? If one were to harvest partridge berry for medicinal use, be extremely careful to tediously cut the stems, and leave the roots intact in the soil. This plant is threatened in some states and is not exactly easy to cultivate. I don’t recommend anyone to take partridge berry, anyway, without consulting her health practitioner. Cultivating partridge berry in shade gardens is a challenge in the South due to its preference for rich, moist soils, and frequent watering requirements in order to become established. If one conscientiously tends to its needs, partridge berry rewards with its year-round beauty and its traditional medicinal significance. The above article originally appeared in the Urban Forager Column of the Athens Banner-Herald, Sunday, November 14, 2010. I heard that Partridge berry useful for women’s health, and I advise these to my friends. And it’s the best-kept secret for women’s health.